Additional banners available for purchase; replace only fabric instead of entire kit! 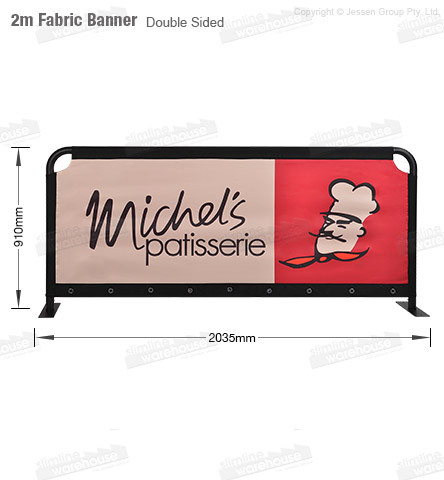 This canvas barrier is 2035 x 910 mm, with a 1910 x 700 mm graphic that helps you easily create an outdoor seating area or section off your booth with a branded banner. The printed cafe banners have your custom designs printed on each side of the banner to maximise visibility. The digital printing process ensures vivid colours and a true to design look that that provides an eye-catching barricade at your location. The canvas barrier, like outdoor wind barriers, utilise black aluminium frame designed for both indoor and outdoor use. Assembly requires no tools, as the clearly labeled snap together poles are simple to set-up quickly. There are ground stakes included for securing the cafe banners to grass or soft ground when used outdoors. For pavement use, there are weight bags available for separate purchase. These versatile displays offer additional banner prints, allowing you to upgrade your designs or make specific designs for different events without having to purchase an entire new kit. Whether displayed outside of a cafe, surrounding your booth at an exhibition, or creating a queue at an outdoor event, these displays help guide customers and inform them of your business at an affordable price!